Dentistry in cats is not easy and is even more difficult in general practice without specialist dental equipment. Cats have thin, fragile roots that are easily broken, the oral cavity is small and difficult to work in and they have a higher incidence of some diseases that make successful treatment even more difficult. We often deal with cases in cats where disease is advanced and the animals can be in extremes of discomfort. Dental Resorptive Lesions (RLs), also known as Neck Lesions or Odontoclastic Resorptive Lesions (ORLs) are a dental disease that can be seen in a number of species. They are however, very common in cats. Although the process of the disease is becoming more understood, the cause of the disease is still not clear. The lesions are caused by the inappropriate action of cells called "Odontoclasts", and the always start on the surface of the roots of the teeth. Eventually, the lesions may become visible on the crown of the tooth and appear as pink fleshy lesions. With time, the crown of the tooth may be lost and is a common cause of missing teeth in a cat's mouth. In humans, when the lesions appear on the crown of the teeth they become painful and the same is thought to be true in cats. There are two tyes of Resoptive Lesion, those that are primary lesions and those that are secondary to inflammation in the cat's mouth. 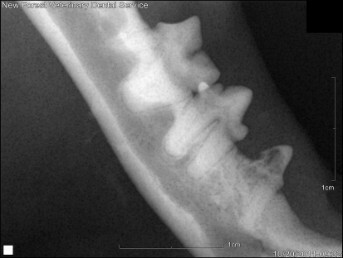 The difference can only be assessed fully with dental xrays and this needs to be done to decide the most appropriate treatment for them, as this is not the same for the different types of lesion. Diagnosis of Resoptive Lesions is made by examination of the oral cavity, where a dental probe can be used to assess any lesions on the crowns of the teeth. The lesions can be hidden by accumulations of calculus or by overgrowths of the gum tisue. Dental Xrays of the tooth roots are essential in the formation of a management plan, as often only some of the root/roots may be affected. The current recommendation for treatment of Tooth Resorption is extraction of the affected teeth. This can be extremely challenging, as the roots can often become fused to the surrounding bone. This can only be assessed with xrays of the teeth. Although every effort should be made to fully extract these teeth, sometimes, and only if it is clear from the xrays that the root of the tooth is no longer present, then the crown of the tooth may be removed and the gum sutured over the top. If this is done then the extraction site must be closely monitored for good healing, as the progression of the root resorption cannot be guaranteed and the root may still need to be extracted at a later date. The roots should only be left in when xrays have been taken to assess the type of lesion pre-operatively, as there is no way of asessing the extent of resorption without them. Chronic Gingivostomatitis is a common and debilitating disease that affects mostly cats. It is also known as Faucitis or Lymphocytic plasmocytic stomatitis, but all of these are just descriptive terms and are not an actual diagnosis. It is a poorly understood condition that seems to be linked to certain viral infections in cats, in particular Calicivirus but also others. Cats infected with these viruses seem to develop an inappropriately severe reaction to plaque present with the mouth and on the teeth. The diagnosis of Chronic Gingivostomatitis is made by examination of the mouth. It is characterised by severe inflammation of the gums around the teeth and the mucosal lining of the mouth, which can extend into the back of the cat's mouth. The inflamed gums and mucosa will often bleed, there is usually an unpleasant smell and the cats will often be excessively salivating. As the condition is painful, some cats will stop eating, lose body condition and coat quality and with time can become severly debilitated. The first stage of treatment will often involve a blood sample to assess any other potential underlying cause of this disease such as renal disease. It will also involve assessmnet of viral infections which can be done by blood sampling and swabbing of the mouth. After this, the patient will be anaesthetised and a full examination of the mouth, including xrays of all the teeth, will be made to assess any concurrent dental disease. The current recommended treatment is extraction of all teeth affected by periodontal disease, plus all of the premolars and molars. Sometimes, extraction of the canine teeth and incisors may also be required. The aim is to remove any surfaces where plaque can accumulate. It is essential that all of the teeth and their roots are extracted, otherwise the inflammation will persist. This requires dental xrays to be taken after the extractions to ensure that all of the tooth structures have been removed. This procedure demands a high level of skill and should only be undertaken by a veterinary surgeon with suitable experience and equipment to deal with these cases. The cases become even more complicated when ctas are presented with Resorptive Lesions along with Gingivostomatitis. Cats cope very well after these dental extractions, and are usually much more comfortable after the procedure. The inflammation will often start to improve rapidly but make take some time to completely resolve. They will usually continue to eat all types of food even after their teeth have been extracted. Sometimes, these extractions are not enough to successfully treat these cases, and additional medical treatment may be required.